For new users setting up Cardsphere accounts, probably the biggest challenge is getting your Haves list fully inventoried. It's often a big time commitment, and for people not yet certain if Cardsphere is right for them, it's a lot to ask. Of course having a complete inventory is what really shows off Cardsphere's power. You can unload Hydroid Krasis anywhere, but there's nothing quite like the rush that comes from extracting value from other cards attached to that sale. Very often low-value cards you couldn't buylist or trade away locally. Converting bulk, basics, and tokens to Cardsphere credit (with its very high buying power) is the best way to turn dabblers into permanent members of the community. This is why we provide so many ways to update your inventory. Here today we'll take a look at the various ways you can add to your inventory, and provide a few tips around doing so. The first way to add cards is fairly straightforward. You go to your Haves page and type in cards one printing at a time. As you type the card name in, Cardsphere provides suggestions so you can just click on the card name. Once the name is set, the rest of the options get pre-filtered for you; only sets that actually included that card are displayed as choices, as are only relevant finishes. This method of entering inventory offers you the most control, but also takes the most time. You don't really want to do this for thousands of cards or your hands will look like a Growth-Chamber Guardian's claws by the time you're finished. We recommend people use this method when they have a few cards they've picked up to enter. When you do so it's a good idea to add a tag with the current date, as shown above. Doing so means you have a way to back out of your changes, in case something goes wrong. Simply filter your Haves to that tag, and delete all the cards shown by the filter as a mass action. It's also useful to sort by Last Modified so that you can see the Haves list populate as you enter card by card. Another way of adding cards manually is to go right to the card page for that printing, and add the card to your inventory. Search for the card to enter or browse sets to find the right card, and then click Add this to Haves. The familiar dialog pops up and you enter the card just as you would on your Haves page. Adding cards from the card page is especially useful when you aren't sure which printing of a card you have, as with Chronicles and other less notorious reprints. Browsing and searching the sets to find card pages is also a good way to find special printings or basic lands to add, because you can compare the picture to the card you have. The card page also shows you the other printings of the same card in your collection. 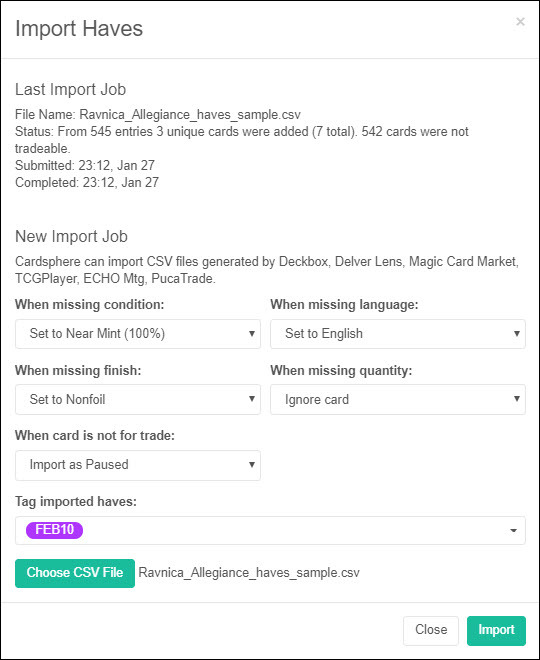 If you don't already have an inventory in CSV format, Cardsphere also provides sample CSVs on each set page, using our native format. Just click the table icon to download a sample. These are especially useful when you buy a booster box to draft. Once you're done, sort the cards and plug the numbers into the same CSV for the set, and you're ready to import all your new cards. Once you have a CSV inventory, you're ready to import the file. You do this on the Actions tab of the Haves page. Click the Import button to get started. At the top of the dialog, information is provided about the last time you did an import. Make sure to check the filename to make sure you aren't using an old file. In the next section, you tell Cardsphere how to handle incomplete information when it's encountered. For example, if the CSV you are using does not specify condition, you can set all cards to NM if you know this is the case. Or if a quantity is not specified, you can ignore the card and do nothing. As with the other ways to enter inventory, you can also attach a tag to the whole job. This is especially useful when doing a large import because when you're working with even more data than usual, you want to be certain you can undo your changes in case something's gone wrong. 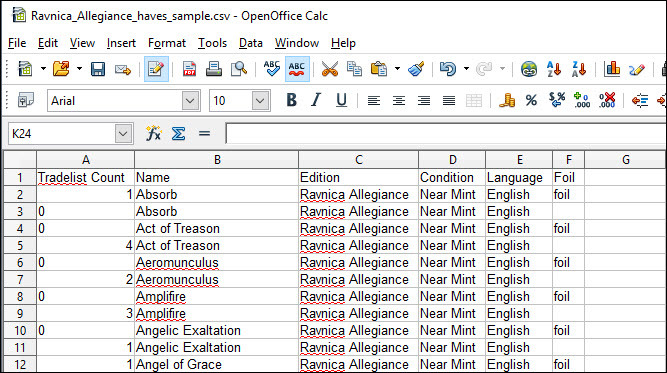 Choose the CSV file and click Import. Once the import job has started, you don't need to stay on the page. You can do other things while the import is processing. To check on the status of the import, go back and open the dialog again, checking the Last Import Job details. If there was an issue, you can review the log. In the example above, spelling errors in the Card name prevented the import. We'll always try and give you the information you need to correct the problem. Keeping an updated inventory is an important part of being successful as an online trader or seller, especially if you use multiple platforms. We're very excited that there are projects underway to allow for conversion between various platforms' CSVs more easily, and plan to support these as much as possible. If you have any trouble finding particular cards, drop in our Discord server. The admins, moderators, and community members are happy to help. Lord Tupperware takes us through the next evolution of BREAD, specifically tuned to guide players through Chaos Drafts: B FREE. Markus Leben applies bottom-up design against the Oblivion Ring bug, and comes up with some interesting new cards along the way.